The above photo summarizes the purpose of yesterday’s helicopter flight out to the glacier. 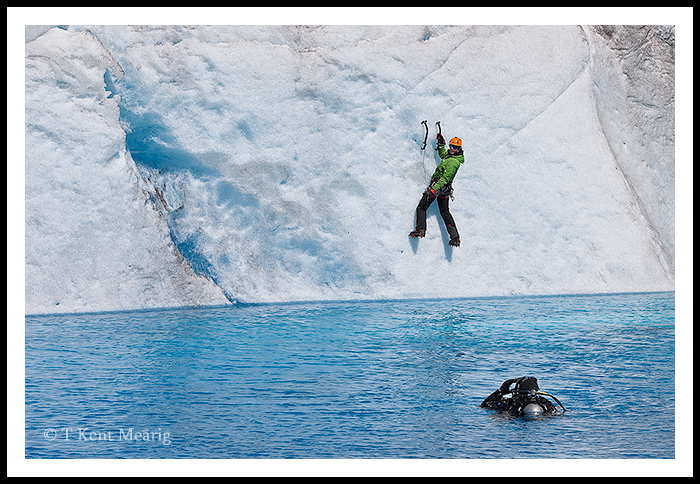 I never would have guessed (even a week ago) that I would see someone scuba diving in a supraglacial pool this summer, but it sure was fun. The short video below shows the bonus round where I tried to do Corey proud with dual cameras running. Cold water? Yeah, I think so! Kent, well done. I have to admit though, your swimming is much better than mine when I jump in. All I can do is revert to the doggy paddle in such cold water.